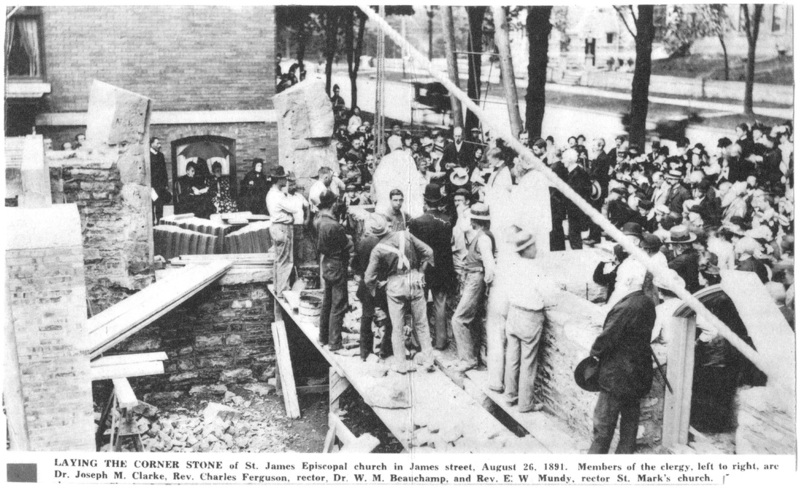 It was decided to rebuild the church at a new location and a lot was acquired at 437 James Street, where the church stands today. On May 15, 1891 the Vestry accepted plans for a new church as drawn by Asa L. Merrick (1848 – 1922) of Syracuse. Designed "in the 13th Century Gothic style,” it was to be 120 feet long and sixty feet wide, with a “battlement tower” eighty feet high and a shorter secondary tower at its southeast corner. But these plans were scaled back due to their cost. The cornerstone contains copies of the Bible, the Book of Common Prayer and other papers, including Dr. Gregory’s plea against pew renting, as well as a small bell recast from the material of the old bell of St. James. 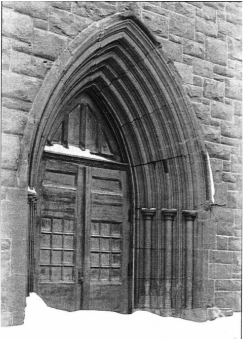 It was possible to salvage the cut Fulton brownstone from the ruins of the old church and the front portal of the old church was moved intact to become the east entrance of the new building.